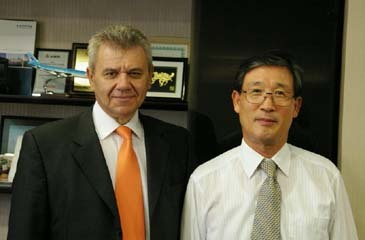 Bulgarian Commercial Counsellor Chavdar Penev (left) poses with Chairman Kim Kyong-Hae of Comunications Korea in Chairman Kim's office in Seoul on July 26, 2007. "Situated at the crossroad of European Union Bulgaria provides an ideal location for the Korean business investors," said Commercial Counsellor Chavdar Penev of the Bulgarian Embassy in Seoul. "There is a great room for mutual economic cooperation between Bulgaria and South Korea." 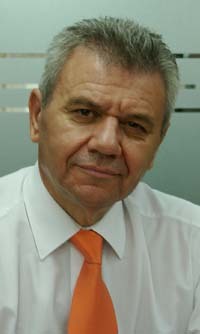 In an interview with The Seoul Times on July 26, 2007, Mr. Penev sounded quite confident in forging and developing mutually beneficial business between Bulgaria and South Korea. He will organize business and media delegation for a trip to the Eastern European country. In the fall, he will lead the delegation to Bulgaria for an investment opportunity there. He also plans for hosting an investment seminar for the local businessmen to be held in Busan in the coming fall season. "I guess we can learn a lot from South Korea for the economic development," he said. "Decades ago Korea was a poor country but it now is world's 11th largest economy." Mr. Penev introduces wine, rose oil, yogurt, and cheese as the main farm products of Bulgaria. Not many people around the world associate Bulgaria with wine. But in actuality, Bulgaria is pretty well known for its reasonably priced quality wine brands among the European wine connoisseurs. Some 50 major wineries within Bulgaria produce 220 million liters of wine per year. Its national brands include Gamza, Mavrud, Melnik, and Pamid. Bulgaria is the second largest exporter of wine bottles in the world only after France. "Quality is equally as good as that of France, Italy, or Germany," he said. "But prices are way cheaper," he boasted. Mr. Penev said that the embassy would organize a wine tasting sometime in November with the local wine importers. During the interview Mr. Penev also touched on Bulgaria's rose oil. Bulgaria exports about 1 ton of rose oil to such countries as France, United Kingdom, USA, and other Europeans countries. "I'm looking for the South Korean business partners for importing and locally manufacturing the rose oil perfumes," he said. He paints a rosy picture for Bulgarian rose oil business in the South Korean market. One kilo grams of rose oil can fetch 5,000 US dollars. In October Bulgarian rose oil producers will be in Seoul for business partnership with local companies, according to the counselor. Bulgaria has yet to open South Korean market for the rose oil. Japan, Singapore, Hong Kong, and China are already importers of rose oil. Mr. Penev also said that Bulgaria would like to promote its tourism industry particularly among the South Korean tourists. He said that some 3,000 South Korean people mostly businesspeople visit Bulgaria per year. Bulgarian Commercial Counsellor Chavdar Penev (left) poses with President James Cheong of James Forwarding Corps. in Cheong's office in Yeoksam-dong, Gangnam-gu, Seoul on July 26, 2007. "We have some perfect Black Sea summer resorts, also we have mountain resorts during the winter for skiers as well as spa resorts," he said. Even Austrian and Swiss skiers visit Bulgaria for good facilities and quality snow during the winter time. Village tourism is gaining popularity with foreign tourists as an alternative form of tourism. The foreign travelers are interested in milking cows and producing cheese in the Bulgarian villages. As part of his efforts to boost tourism a Bulgarian delegation led by Chairwoman Anelia Krushkova of Bulgarian State Agency for Tourism will visit Seoul in October or November this year. She is expected to sign a memorandum of understanding (MOU) with her counterpart of the South Korean tourism ministry. The Bulgarian tourism delegates will a gathering with the local tourism agencies and hold a press conference with the local media. He stressed the advantages of the Bulgaria's geographic location within EU countries. "Bulgaria is like a thumb, it can touch all the other fingers easily," he said "Bulgaria is the best transport place for South Korean and other foreign investors with EU block." Bulgaria joined the EU in January this year.